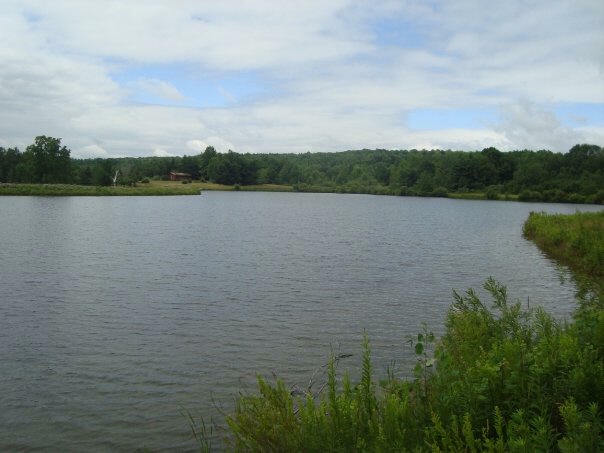 The Bristol Hills Trail is a branch trail of the 900+ mile Finger Lakes Trail System. The trail winds over 50 miles from its northern terminus at Ontario County Park, through Naples, NY and on to it's southern terminus at the main Finger Lakes/North Country Trail near Mitchellsville, NY. The trail is marked with orange blazes and passes through numerous state forest and Hi Tor WMA. It is a great long weekend backpacking hike for those who have a shuttle. 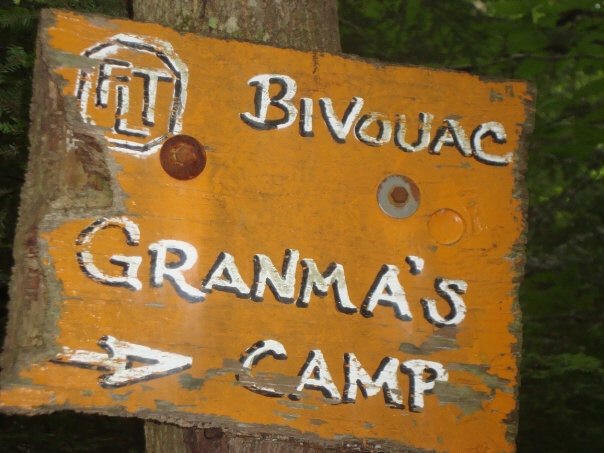 NOTE: From the FLTC website (May 2011) -> there is a 0.5 mile long reroute from the the junction of Two Rod and Hungry Hollow Roads (latter formerly signed Dineharts) to just east of Granma's Campsite. From north to south: From the junction of Two Rod and Hungry Hollow Roads proceed westward uphill on Hungry Hollow Road. Soon after passing state forest boundary on the left, turn left off road entering Pigtail Hollow State Forest. Proceed generally southwest to join existing trail just east of Granma's Campsite. The new trail avoids a long fall hunting closure and eliminates the old route's sodden wet hillside and steep gully crossing, way more pleasant and easy. 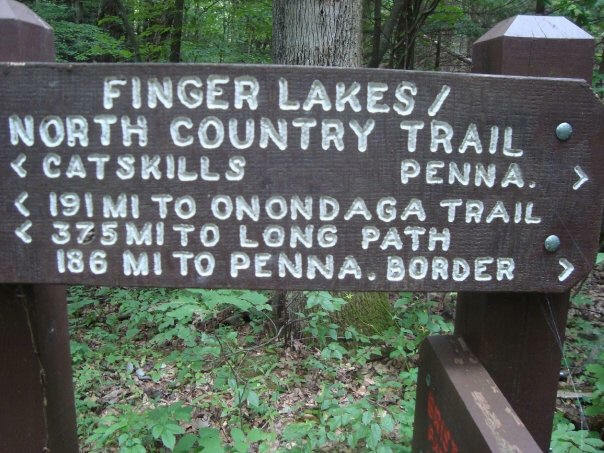 This section covers the trail from Two Rod Road to the southern terminus of the trail at its junction with the Finger Lakes/North Country Trail. Some of the trail in this section passes through Pigtail Hollow State Forest, however much of the trail is on private property. This last section of the Bristol Hills Trail starts off with a short steep climb into a hemlock forest on private property before entering Pigtail Hollow State Forest. The trail passes a blue blazed side trail on the right that leads 150 feet to "Granma's Campsite". The trail goes by an old house foundation before descending toward Mitchellsville Road. The trail follows the road for 200 feet before following an old logging road steeply along a ravine back on private property. The trail runs along Lake David, then goes back into the forest before reaching a trail register. The trail briefly emerges from the forest for some views and winds its way to cross Harrisburg Hollow Road. The trail follows the edges of fields before crossing two steep gullies on its way to the trail's southern terminus at the junction of the white blazed Finger Lakes/North Country Trail at the abandoned section of Ferris Road. The closest parking is to the west on the corner of Ferris Road & Harrisburg Hollow Road. Look below for a map and a more detailed description of this section of the Bristol Hills Trail. 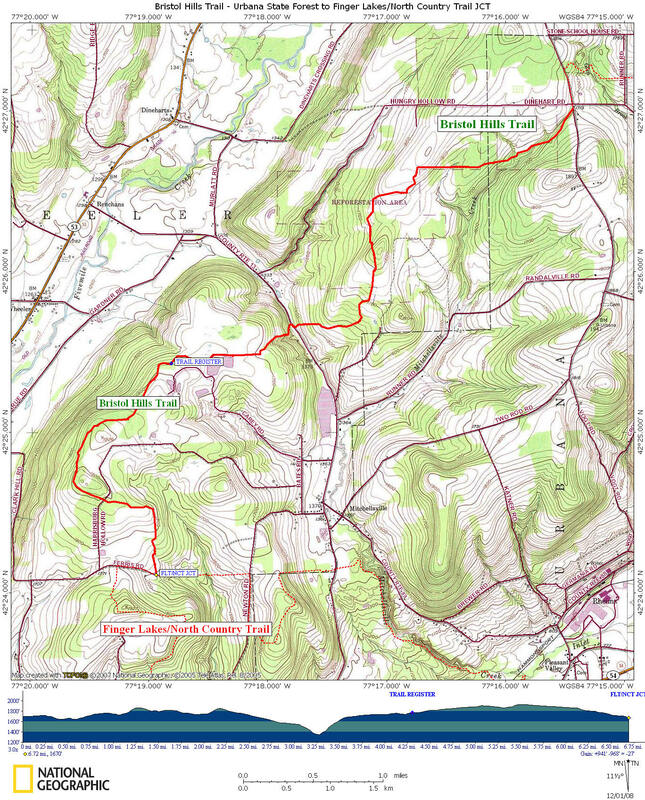 You can help support this trail by purchasing official Bristol Hills Trail maps from the Finger Lakes Trail Conference or volunteer! You can also find the latest trail conditions from the Finger Lakes Trail Conference website under the "trail conditions" link. Trail leaves Two Rod Rd just south of Hungry Hollow Road. Entering Pigtail Hollow State Forest. Blue trail on right leads 150 feet to "Granma's Campsite". Begin descent to Mitchellsville Road. Leaving Pigtail Hollow State Forest. Reach Mitchellsville Road (County Route 13). Turn right on road and in a couple hundred feet turn left across a stream and ascend steeply on an old logging road. Parking. Lake David on your left. Southern terminus of Bristol Hills Trail at the Finger Lakes/North Country Trail junction. Right is Ferris Road and left takes you to Newton Road.